With its stylish Italian front of house design and patented stepless micrometrical grinding adjustment, the Mazzer Mini Timer Coffee Grinder is a premium quality addition to any bar, pub, or specialised coffee house. The robust flat grinding blades create an excellent quality grind in doses of 5.5 to 8g, and, alongside the added functionality of the timer and automatic start. The superb Mazzer Mini Electronic Coffee Grinder is suitable for use in the home and lower volume commercial applications. Features included a 64mm burr set (the same as the Super Jolly models), two programmable precision dosing timers, and the legendary Mazzer build quality. Although the Mini E’s motor is driving larger burrs, the housing is the same size as the standard Mini. HOW DOES A MAZZER ELECTRONIC GRINDER WORK? The Mazzer Mini Electronic allows the barista to program a specific grind time for both a single and a double shot using the touch panel on top of the dosing chamber. The digital display on the panel shows your chosen shot time, as well as keeping record of total shots ground. The programmable single and double shot buttons can be set in .05 of a second increments. It grinds directly into your portafilter for minimal waste. The Mazzer Mini Timer has a variable timer control wheel on the side. The machine will grind coffee for the period that the timer is running and stops when it returns to zero. This can be adjusted for your requirements. The height of this grinder is 480mm when using the 600g hopper supplied. 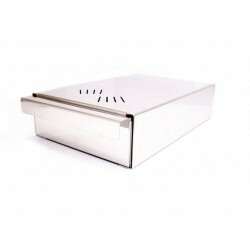 A larger 1.2kg hopper is available separately, which increases the height to 550mm. 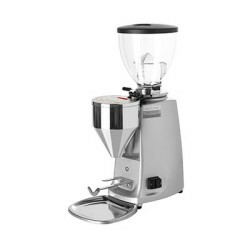 WHAT ELSE DO I NEED TO KNOW ABOUT THE MAZZER MINI? 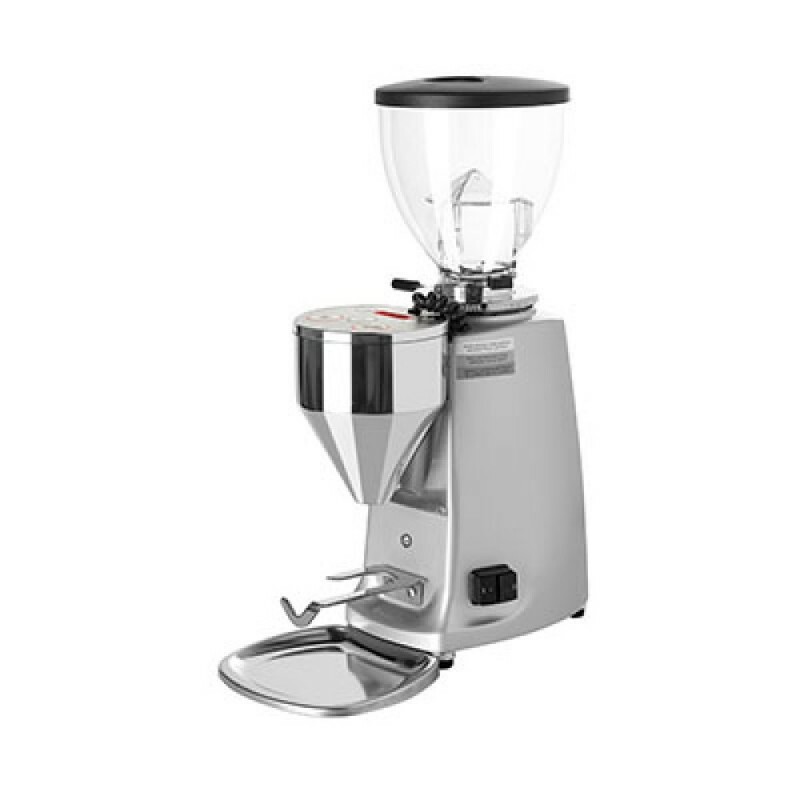 The excellent Mazzer Mini was originally designed with commercial use in mind, but as people have become more knowledgeable about coffee and more discerning about what they drink at home, they are now also bought by coffee lovers who want a high-end grinder in the kitchen at home. It is particularly well suited to home use as the infinite grind adjustment found on all Mazzer Mini models can cope with anything from a super fine espresso to coarse grinds needed for cafetiere coffee (French press). Another feature that makes it great for home use is that the powerful 250 watt motor is very quiet, so it doesn’t feel like you’re using an industrial machine in your kitchen. The motor is extremely strong and doesn’t bog down when placed under load, meaning a longer working life and a more consistent grind. The burrs are made from Swedish hardened steel and are widely regarded as being the best currently available, again meaning they are more durable that many of its’ competitors. The clever design also means they are very easy to calibrate and even easier to clean should you need to access the burrs themselves. Of course you can use cleaning crystals instead and this removes the need to even clean the burrs directly.